It's Monday morning here in Japan, and I took a little time off to watch my New England Patriots win the most thrilling Super Bowl in recent memory. Yes, the Super Bowl at 8:30 in the morning, it never gets old! Now that it's over and head coach Bill Belichick and quarterback Tom Brady are champs once again, I am having a really hard time focusing on anything else, especially video games. Well, at least this story pertains in some way to my job. As you may or may not know, the Madden NFL franchise from EA Sports runs an AI controlled simulation between the two competing teams before the big game. It also has an amazing rate of success at picking the winner. Prior to this Super Bowl, it could brag about an 8-3 record, and two of the incorrect picks came from losses nobody saw coming. Now, EA Sports can now chalk up another addition to the record. 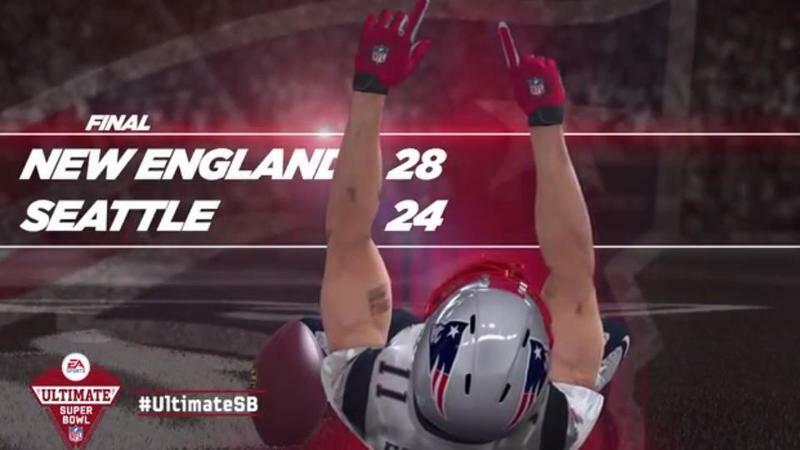 With the Patriots' victory, the Madden NFL simulation now boasts a 9-3 overall record. However, that's not where the story ends. This year's prediction was special because of how shockingly accurate it holds up compared to the actual game. In the simulation, the Seattle Seahawks were up 24-14 in the 3rd quarter, and in the actual football game, the Seahawks were up 24-14. Also freakishly accurate, the Patriots came roaring back with wide receiver Julian Edelman pulling in the game's winning touchdown. Both the simulation and the actual game closed out at 28-24 with a Patriots victory. However, what it did not accurately predict was the most insane interception in the history of the Super Bowl! Superstar cornerback Darrelle Revis, who got the interception which set up Tom Brady's winning drive in the simulation, was relatively quiet all night. Instead, it was undrafted rookie Malcolm Butler who closed out the game with a ridiculously smart snag of a misplaced and hotly debated pass. I'm not even sure if Malcolm Butler was an afterthought in the gameplan of the Madden simulator, but his Cinderella story victory is certainly going to make sure he makes the cut next year. Sorry, I'm no sports writer. I'm just a nerdy video game geek who also happens to love football and the New England Patriots! Thrilled to see my team be the champs again, and thankful to EA Sports for giving me an outlet to write about. Now I can get back to work.